Bachelor of Science (animal science major) and diploma in Animal Health Technology. Emily has a special interest in dentistry and has received additional training in this field. In addition to her regular vet tech duties, she is responsible for managing all of the inventory at EPVVH. 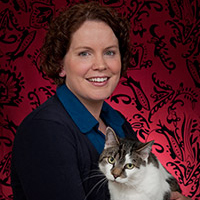 Originally from Annapolis Royal, she now calls Eastern Passage her home, where she lives with her 2 rescue cats, Slick and Sasha and also cares for her two feline siblings, Portia and Beemer. In her free time, Emily enjoys playing music, knitting and sea kayaking. She also organizes a team each year for “Run for the Cure”.